The NIKE GOLF Dri-FIT Mobility Camo Shirt is custom embroidered with your logo. Nike has engineered a sport shirt that takes comfort to the next level. 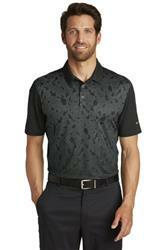 The Dri-FIT fabric gives superior moisture management. The contrast NIKE Swoosh design trademark is embroidered on the left sleeve. Made of 6.3-ounce, 87/13 polyester/spandex Dri-FIT fabric. Features include a self-fabric collar, three-button placket with dyed-to-match buttons and open hem sleeves Dri-FIT fabric. Price includes embroidery up to 7000 Stitches! Available Colors: Midnight Navy/Photo Blue, Black/Dark Grey, White/Cool Grey. Available Imprint Options: Front, sleeve, back. Additional embroidery locations add approx. $3.00 depending on stitch count. The contrast NIKE Swoosh design trademark is embroidered on the left sleeve. Made of 6.3-ounce, 87/13 polyester/spandex Dri-FIT fabric. 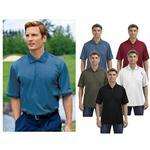 Features include a self-fabric collar, three-button placket with dyed-to-match buttons!